As we start the new year, I am pleased to announce my first structured pick for 2019. 5. Is wrapped in a tax-efficient package especially designed for South Africans. Let’s break down each of these points down further. When high profile CEOs start buying up company shares, so should you! Given current market conditions I especially I like that this product has a capital guarantee. I’ve recommended quite a few capital-protected products over the last year-and-a-half and, given the recent market movements, I can tell you every single person I know who has invested is exceptionally happy with their decision. Investors with “long-only” market exposure have not only seen very low growth, but many people have seen their retirement and discretionary funds actually shrinking! Today’s investment idea gives you 112% of your money back, in US Dollars, no matter how much the market may fall in future. This is by far the best (and largest guarantee I have ever seen). And, in this environment, being able to offer a guaranteed positive return in USD is really something to write about! Many who know me, know how much I love this country. But it doesn’t matter how much you or I love South Africa, if you work here, if you own a house here and have your pension funds locked up here. The decision to seek foreign investment exposure is really a “no-brainer”. Just the fact you are a South African tax-payer means you likely have a significant portion of your portfolio tied to South Africa’s future. The international diversification argument is a strong one. Especially looking at the sub-par returns delivered locally over the last 5 years. Add to that the fact 2019 is going to be a very volatile year for SA as we approach the national election, and this becomes a compelling proposition. Not only does this product physically take your funds outside of South Africa (and turns them into US Dollars) it also takes care of some of the estate planning issues that plague SA investors offshore. Along with the great capital guarantee of 112%, you will also get 200% of any market upside. That means if the underlying index goes up 10% you add 20%. If it goes up 30% you will add 60%. On top of that, this upside is uncapped. 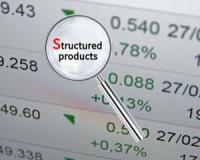 This is something we don’t often find with structured products. I’ve included the table below to clearly show the products payoff profile. The figures below are based on an investment of $100,000. The next question is important. Before making any investment, you should always consider who the person responsible is for giving you your guarantees. Basically, an investor must ask: How safe is this product? Today’s pick is guaranteed by a bank that is Rated “A” by Fitch, “A3” by Moody’s and “BBB+” by S&P. This places it among the top tier of international banks. This is several notches above anything you can find in SA, and that includes the South African Government. If you’re the average South African, it is quite possible this is a safer investment vehicle than anything else you might own. I’ve left the best for last. Many people confuse “offshore investment” with “tax evasion”. Unfortunately, if you’re a South African resident you fall under South African tax regulation. There is no way around that without committing a crime. The good news is there are very clever ways to make an offshore investment both compliant and beneficial for investors in terms of their tax obligation. This entire product is placed within a tax efficient wrapper. If you’re paying the highest marginal tax rate, it will reduce your tax liability by around one third. Now, as my regular readers will know, these types of products are also called “term-products”. That means they close to the public on specific dates. And, if you’re not invested you will not be able to access these terms again. I’ve had many investors approach me on the previous structures I’ve discussed but unfortunately there is nothing we can do once the product is closed. This specific product, which is called the Sanlam European Capital Protector with a 6 year term, will close at the end of February 2018. So, if you’re interested you need to move now and get in ahead of tax year-end. If you’d like to find out more, please feel free to contact me on support@randswiss.com. P.S: JSE Top Penny Stock 2019 Report: You could make a fortune with the 5 potentially explosive shares hand picked by our market expert.